BRIDGETOWN, Barbados, Dec 29, CMC – The Barbados-based Regional Security System (RSS) Friday ended its humanitarian mission to Dominica, just over three months after Hurricane Maria devastated the island. The category five hurricane swept over the island on September 18, killing at least 29 people leaving behind billions of dollars in damage to infrastructure, destroying an estimated 90 per cent of the housing stock and downing power lines. Troops from the RSS, including the Barbados Defence Force (BDF), had been on island since September 20, providing relief supplies and rendering assistance in law enforcement, among other areas. 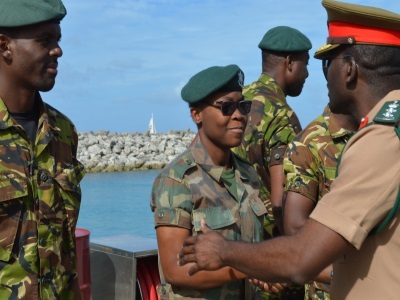 They returned here on board the Barbados Coast Guard vessel, HMBS Leonard C Banfield, which made the initial voyage, and were greeted by Barbados Defence Force (BDF) Chief of Staff Colonel Glyne Grannum. “Your contribution has been significant, valued and highly appreciated especially given your last effort, the last chapter, in which you lot would have sacrificed Christmas and a significant portion of the holiday season with your families, your loved ones, in order to render service and to do what was required to help Dominica back on its feet,” Grannum told the troops. He added that rehabilitation efforts are ongoing, even though the RSS members have returned home. Grannum visited the troops in Dominica on Christmas Day, as part of the annual visit to the island’s military bases. He told reporters that the assistance of regional troops was critical to the recovery efforts, particularly in the immediate aftermath of the storm. “Because with the best will in the world, the Commonwealth of Dominica Police Force they were stretched. They were working long hours, and they themselves suffered losses at home where they needed the augmentation for specific periods to help them rehabilitate. “And in that regard, though not on this rotation, I must point out the contribution of the Royal Barbados Police Force and indeed our own Barbados Fire Service, those were significant contributions to helping Dominica get to where it is today, the 29th of December, and indeed going forward, a signal as to how we can continue to help the process and to help the country,” he said. “We (BDF) remain one of the leading member states of the Regional Security System and in that responsibility is the Barbados Defence Force to maintain a level of commitment to the security alliance. And that would mean if they require assistance in terms of operations, relief, reinforcement to their police force or their disaster response mechanism, that we would be willing to step up and to redeploy persons to help in particular cases. Grannum said such planning is all the more critical, given that the next hurricane season begins in the six months. “So going forward we are determined to continue to assist Dominica as is required with specific items and to include wider readiness within the RSS and within the CDEMA mechanisms for our regional effort. “And we ourselves in Barbados, we need to be ready. There’s nothing that says we can’t be affected to the scale or worse than Dominica, so we need to take a particular consciousness, awareness and readiness to getting ready for severe weather systems like hurricanes,” he said. 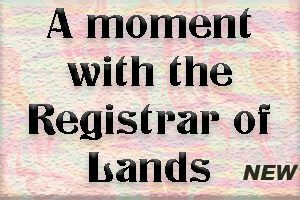 According to Grannum, this state of readiness should not be confined to the military, but should also involve the wider society. “Being ready is really a change in behaviour. It is a complex scale of activities involving not just us in the military, but communities, what they can do to develop plans for looking after vulnerable persons, it involves … taking care of the environment, it involves supporting those who go into harm’s way,” he said.